Today, we're talking about ways to carry your passport. 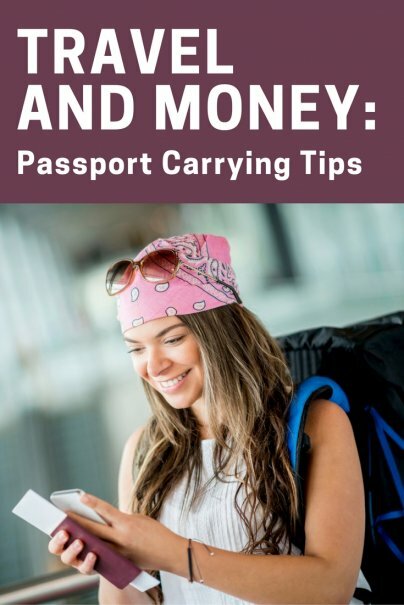 Although carrying your passport doesn't directly pertain to your money, losing it (or having it stolen) can be a costly disaster to contend with that could throw an unwanted curve ball into your vacation. Here are some techniques to help you reduce the chances of your passport going missing, and to make the recovery process much easier for you if it does. You need your original passport for border crossings and navigating airports. In most other cases (such as checking into accommodation) you can use either your original or a copy (we'll get to that in a minute). So the only time you need to have your original passport on your person is when you're actively traveling. I keep my passport in a slim passport wallet that I wear around my waist which fits underneath my clothing. I can access it subtly in a pinch, and keep it relatively hidden and secure when I don't need it — thus reducing the chance of it being stolen from my purse or pocket. When I'm settled in to my accommodation, I leave my original passport in the room. Keeping it in a safe within the room is my first preference; otherwise I lock it up in my suitcase while I'm out of the room. Some hotels and hostels also offer secure storage at reception, which is an option. Aside from clearing official security checkpoints and borders, you can usually present a photocopy when your passport is requested. A simple copy of the photo and signature page will do, as it contains all the information necessary for somebody checking your identity. The reality is, the less you need to handle your passport in public, the less the chances are that your passport will go missing or get stolen. So whenever you can use a photocopy of your passport, you should. I keep a photocopy of my passport with me at all times, in my purse. That way, I have viable identification when needed, and if something happens to the original, I have a backup copy that I can march into my consulate with to start the recovery process. I'm all about double and triple backups since I travel full-time, so I also have a scan (picture) of my passport's picture and signature page. I keep a copy of this on my computer, as well as on an encrypted USB stick that is kept underneath my clothing at all times. Some people also like to email themselves a scan of their passport so they can access it electronically if necessary. With this extra level of backup and security, I know that even if everything I own goes missing, I can still walk into my consulate with the USB stick and get the help I need. And as a last (last) resort, it never hurts to leave a copy of your passport with somebody at home. You never know if or when it will be necessary, and when you travel, it's always better to be safe than sorry. If you're applying for your passport, check out this article on getting passport pictures on the cheap. If your physical appearance has changed significantly since your passport photo was taken - say, maybe you lost a lot of weight, grew a goatee, or radically changed your hairstyle - be sure to take at least one additional form of identification since the difference in appearance can cause problems. I had a panic-stricken several minutes in Moscow customs a couple of years ago because of this! @Rob - Great suggestion. As an additional form of photo ID, I like to have an International Driver's License. It also comes in handy if you want to drive elsewhere in the world! Leaving a passport in a hotel room is bad idea. Always have it on your person. Do not think for a minute that a maid will not sell your passport for more than she makes in a year. Even the in-room safes are a bad idea. Others have a master key. Leave a copy of the original at home that can be faxed to an embassy if needed. In a number of countries that I travel to you must have your original passport on you at all times. A copy will get you in jail. @John - Thanks for your advice. I guess it depends on where you're traveling...hotels in some cases can be quite secure, and in other cases quite the opposite. If I do leave my passport in the room, I lock it up at the very least. And if I'm in a country where I'm always required to carry my original, I will stick it in an under-clothes wallet. Where though, will only having a photocopy land you in jail? I'd never heard that before. I think you also have to weigh the odds: what are the odds of having your passport mugged from your person, versus being stolen from the room? The answer depends highly on where you travel. This article gives some bad advice. As John K. noted, many countries require foreign visitors to carry their passport at all times, to prove that they have a legal right to be in the country, and officials such as the police can (and do!) regularly stop people to ask to see their passports. Not carrying the required documentation can see you owing huge fines, in jail, even deported. Furthermore, if you're involved in any incident - a traffic accident, for example - you will often have to show your ID, which would only mean your passport if you're outside of your home country. Also, in most cases, a copy of your passport is NOT an acceptable substitute for the original, and there are many cases where we might assume that showing a passport isn't necessary and try to refuse, when in fact it is actually a legal requirement (hotel check-in in many countries springs to mind as an example). So, when traveling, always find out what the local requirements are re: passports, and find a safe way to meet the requirements. Carrying your passport all the time is worrying and inconvenient, yes, but being caught without it when you need it is often much worse. i was a pakistani student in uk and lost the photocopies ohf my passport there what should i do ? Yep, that's how I do it. Keep a copy on me almost all the time, have a backup in an email, as well as a backup with someone at home, and keep it handy when crossing borders (usually near the top of my backpack, or in the zippered compartment on the top of the backpack). And in regards to Rob O's suggestion, since the passport is smaller than an 8.5 x 11 piece of copy paper, I also scan a copy of my drivers license onto the same sheet as my passport.